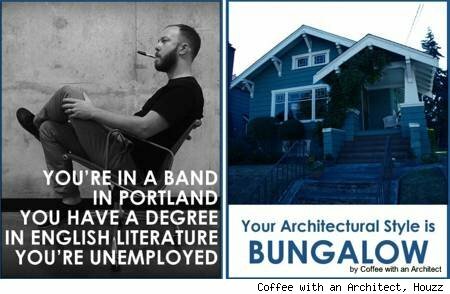 It can be hard to decide what your personal architectural style is. There are so many choices. And if you're trying to choose something important - like, say, the house you want to live in for the rest of your life - well ... you should probably get that choice right. But how can you tell what style you are? Is there a guide? Well, no, actually. There's the summary that the real estate people write, but that's basically science fiction. All ugly houses are called "contemporary." That's not helpful. We need a better system. Something more ... scientific. So I'll give it a try. Using my vast knowledge of architectural styles and my keen powers of observation, I've compiled the following. Feel free to make changes in your life accordingly. This applies to Seattle as well. In most real estate listings, "Cape Cod" means small and painted white. I think I hate this guy, but I'm leaving my card with him just in case. Maybe he can give one to his father as well. Mad Men? Or Sad Man? See the rest of this sassy slideshow on Houzz. See four hip bungalows from around the country. See three charming (and expensive) Cape Cods from around the country. See four over-the-top Greek Revivals from around the country. See three jaw-dropping Italianate-style homes from around the country. See four gorgeous Midcentury Moderns from around the country.